Below you can learn more about the most popular careers and positions within the field of fashion design. Fashion designers are involved from concept to finish in the development and production of clothing lines. While a few designers are able to work their way up in the industry through on the job experience, these days a bachelor's degree is typically the minimum requirement for this position. Designers must have an indepth knowledge of fashion design concepts, sewing, apparel design and garment construction, and be familiar with the different types of textiles and industry trends. Most designers are specialists. They may specialize in women's apparel, children's clothing, or men's wear. Asistant designers are precisely that, assistants. They help fashion designers with every aspect of development and production of clothing lines. Typical duties include developing sketches for designers to work from, preparing presentation marterials for shows and clothing demos, sourcing fabric, etc. Assistant designers are not required to have a bachelor's degree, but many do. Assistant designers often work their way up to become designers. As their name suggests, pattern makers create patterns and specifications for how each component of a garment should be manufactured and put together. Today, pattern makers often use computer software, CAD and 3D imaging to create patterns and develop specifications. Pattern making skills can be learned on the job, by earning a specialized degree in fashion design, or through a technical training program. Many aspiring fashion design students and aspiring designers end up migrating to a career in fashion merchandising. Merchandisers are typically upper-management and high level executives in apparel manufacturing who are responsible for determining which clothing lines, fashion and/or accessories a manfucturer should produce. They plan, research, and determine which fashion trends a company should pursue. 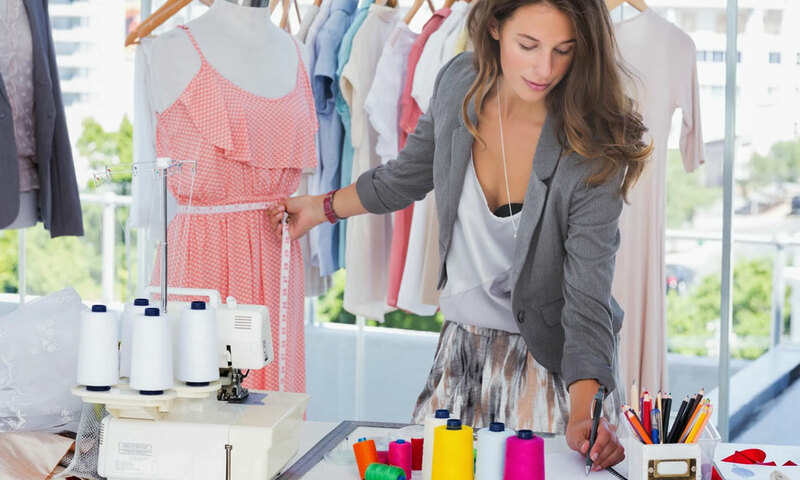 A bachelor's degree in fashion design, fashion merchandising, apparel production, or marketing is typically the minimum educational requirement for this position. Many companies who employ merchandiser prefer to hire candidates with MBAs. Merchandiser can make anywhere from ,000 to 0,000 a year - or more. Buyers plan sales, select merchandise to sell, price vendor orders, and monitor inventory. Buyers are experts at budgeting. They're often given a fixed budget and told to get best return they possibly can. Buyer positions are competitive and typically take years to work into. In addition to a bachelor's degree, buyers are typically required to complete on-the- job training sponsored by their employer and complete an apprenticeship. In order to become a buyer, you must first become an assistant buyer. Assistant buyers help fashion buyers select merchandise, write and price orders, interact and negotiate with vendors, and plan and manage a budget. Most assistant buyers have a four year college degree. This position is also highly competitive as it is a stepping stone to becoming a full fledged buyer. Also known as Divisional Merchandise Managers (DMM), merchandise managers are responsible for supervising merchandise departments and fashion buyers. With a salary ranging from ,000 to 0,000 a year, this position is one of the highest paid within the fashion industry. To become a merchandise manager, applicants must have a college degree and 5 to 10 years experience as a fashion buyer. Merchandise managers manage vendor relations, develop buying teams, ensure consistent quality, and focus on making sure customers receive the value they expect and are paying for. A design director's main duty is to oversee color, trends, and fabric direction for all product lines. They also manage design teams, supervise the manufacturing process and support marketing endeavors. Job duties include market analysis, trend analysis, predicting future demand, production support and building fabric stories. Fashion directors are responsible for having an intimate knowledge of various market trends and using this knowledge to develop effective marketing and branding strategies, and navigating market trends. Fashion directors do a fair amount of traveling and are required to attend the industry's top shows in Paris, London, Milan, and New York. Fashion directors must be able forecast fashion trends, have strong communication skills, and be experts in design and color. They also develop fashion messaging strategies and manage buying teams. Visual merchandising directors work in retail and wholesale sectors of the fashion industry promoting products, services and image. They dress manikins, develop visually appealing fashion displays, and organize special events to promote brand awareness. They also supervise design and concept production, oversee idea presentation, and manage budgets. They must be experts in color and design, have the ability to manage budgets and be highly creative. Fashion editors oversee the creation, development and presentation of content for fashion related magazines and publications. They're also responsible for putting together photo shoots, managing teams, staying abreast of industry trends, choosing looks to feature, curating photography and deciding what should be published - and what shouldn't. They must have exceptional writing skills, be experts in fashion and photography, and have good interpersonal communication skills. 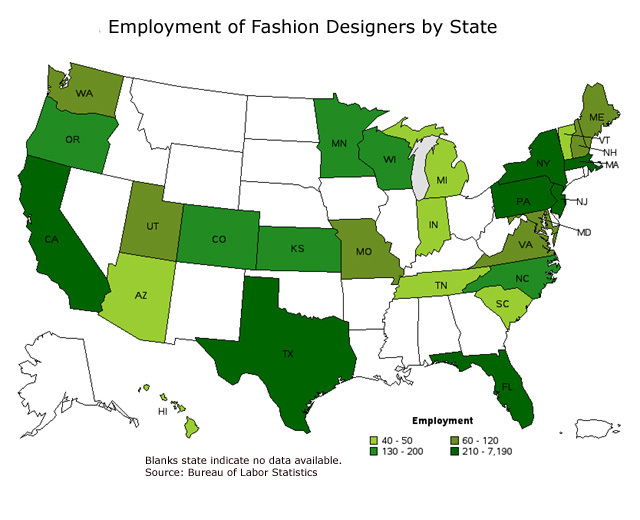 As of May 2014, there were approximately 22,300 fashion designers employed in the United States. Of these, about half worked in wholesale and manufacturing, a tenth occupated corporate management positions, and the remaining worked in specialized design and other related occupations. Between 2012 and 2020, the number of fashion designers employed in the United States is expected to decrease to 21,600 - due in large part to apparel manufacturing jobs moving overseas to more competitive markets. The following is a breakdown of the industries employing the highest number of fashion designers, including employment numbers and wage information per industry. The map below shows the states that employ the largest number of fashion designers, as well as concentration of fashion designers per state. The chart below lists the states that employ the highest numbers of fashion designers, along with the mean hour wage, annual mean wage and location quotient for each state. 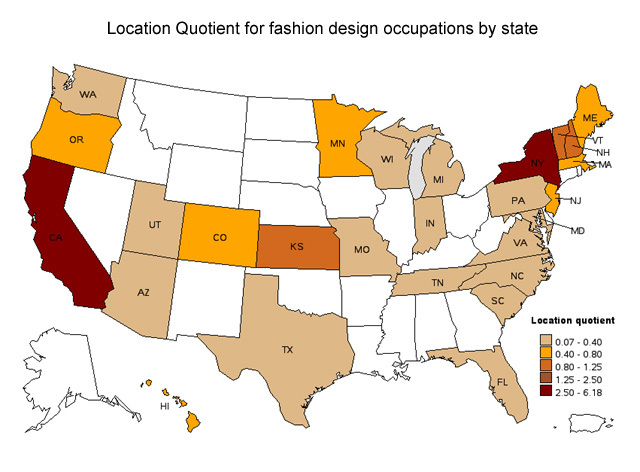 The chart below shows the states that have the highest concentration of jobs and location quotients for the fashion design industry. State Total employment Location quotient Mean hourly way Mean annual wage New York 7,190 6.2 ,900 California 5,750 2.9 ,300 Vermont 40 1.08 ,000 New Hampshire 90 1.04 ,500 Kansas 180 .99 ,000 According to the Bureau of Labor Statistics, the median pay for fashion designers is roughly ,000 a year. As of 2014, 50% of fashion designers earned more than k a year while 50% earned less. The top 10% of fashion designers earn over 7,000 a year, witha few extremely successful designers making well into the six figures. The lowest 10 percent of wage earners in this industry make less than ,000 a year. As is the case with most occupation, how much a fashion designer can earn is in fluenced by many factors, including experience, skill, reputation and employer. Until a fashion designer has substantial experience in the industry, their pay tends to be relatively low compared to other occupations that require a bachelor's degree. Fashion designers that receive a salary typically have more stable income than those who work freelance, independent or as consultants. However, fashion designers who are able to develop their own brand and clothing line can hit it big! Corporate and Enterprise Management ,600 Specialized design services ,600 Apparel production ,400 Apparel and merchant wholesaling ,600 Electronic markets and brokers ,000 The map below shows the annual mean wage for fashion designers by state as of May 2014. 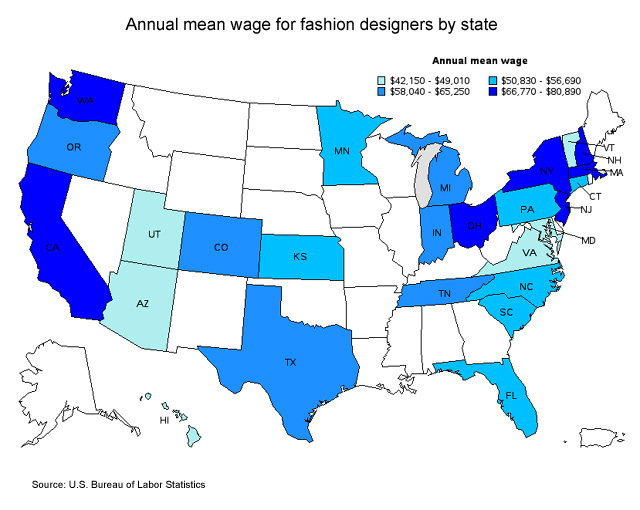 The chart below lists the state with the highest hourly and annual mean wage for fashion designers. When considering employment opportunities, you should consider all factors including wage, location quotient, overall employment and cost of living. State Total employment Location quotient Mean hourly way Mean annual wage New York 7,190 6.2 ,900 Massachusetts 270 .61 ,900 New Jersey 340 .66 ,100 California 5,750 2.9 ,300 New Hampshire 90 1.04 ,500 The highest paying metropolitan areas for fashion designers include St. Louis, MO (,300/yr), San Francisco, CA (,100/yr), NY-NJ Metro Area (,000/yr), Portsmouth, NH (,500/yr), Oakland, CA (,800/yr), Boston, MA (,200/yr), Los Angeles, CA (,400/yr), Portland, ME (,000/yr) and Santa Ana/Anaheim, CA (,400). Again, the annual figures are based on Mean Wage. Actual figures may be higher or lower. A bachelor's degree in fashion design or fashion merchandising is typically the minimum requirement for entry-level positions that will lead to career advancement opportunities within the industry. 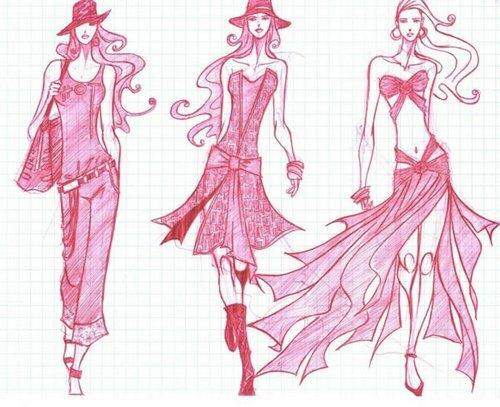 Fashion design programs teach students the ins and outs of fashion, design concepts, industry trends, analysis, textiles, fabrics and how to use computer-aided design (CAD) to develop fashion concepts and apparel designs. Fashion design programs are instrumental in helping students develop a portfolio - a collection of designs that showcase the student's design abilities, experience and expertise. A good portfolio is the key to landing top industry positions. Most employers will decide whether or not to employ or hire a designer based on their portfolio. There are just over 300 higher education institutions in the United States that offer art and design programs accredited by the National Association of Schoos of Arts and Design (NASAD). We recommend earning your degree in fashion design from a NASAD accredited institution. 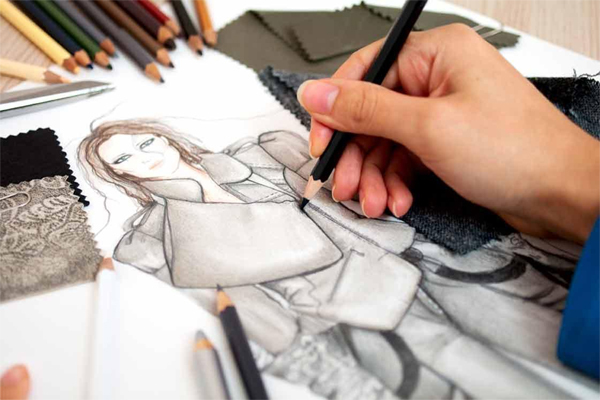 Many fashion design programs will require application to (1) complete prerequisite courses in art and design before being admitted and/or (2) submit a small portfolio that demonstrates their artistic and creative ability. Most successful fashion designers worked their way up the ranks. Fashion designers typically get started in the industry through an apprenticeship, internship or by working as an assistant for a while. Internships are particulary useful for students who want to gain experience while completing their degree. Successful designers are artistic, creative, detailed oriented, are familiar with design technologies, are decision makers and communicate well with others. Search our database of online and campus-based fashion design schools and programs. Accreditation is an important element of obtaining a quality education in fashion design and fashion merchandising. Obtaining a degree or advanced education from an accredited institution will ensure you receive a quality education, that you'll qualify for federal financial aid, and that when you graduate your degree or diploma will actually mean something. There are various forms of accreditation - and not all are equal. The most important type of accreditation is "regional" accreditation. Most four-year colleges and universities (ie., Harvard, Standford, etc.) are regionally accredited. Earning your degree from a regionally accredited college for fashion design institute will ensure you're getting the best education possible, that your degree will be recognized within the industry, and that you'll be able to use your degree/education to pursue other higher education opportunities down the road. Typically, regionally accredited schools and colleges will only accept transfer credits from other regionally accredited institutions. This means that if you earn an associate's degree in fashion design from a nationally accredited community college, you'll be unlikely to transfer the credits you earn to a regionally accredited college or university - which includes most reputable four-year colleges and universities in the United States. The second type of accreditation is "national" accreditation. While national accreditation sounds cool, regional accreditation is preferable. We recommend earning your degree from a regionally accredited institution, especially if you plan on pursuing other higher education opportunities down the road. Again, most regionally accredited colleges and universities will not accept transfer credits from nationally accredited institutions. Earning a degree, certification or diploma from a nationally accredited school is recommended when you're only seeking to enhance your skills, prepare for entry-level career opportunities, and don't have plans of pursuing additional education opportunities down the road. In addition to regional and national accreditation, there is professional accreditation. While regional and national accreditation are general accrediations, professional accredidation apply only to a specific field of study. The most well known professional accrediting body in the fashion design industry is the National Association of Schools of Art and Design (NASAD). Most fashion design institutes and schools are accredited by the NASAD. Between 2012 and 2022, the U.S. Bureau of Labor Statistics estimates that fashion design career field will experience a 3% decline in employment. Employment of fashion designers in apparel manufacturing industries will decline over 50% in the U.S. during the same time period due to an increase in apparel production in most cost efficient international markets. This large decrease in fashion designer employment in the apparel manufacturing industry is responsible for the overall decrease in fashion designer employment of 3%. Not including the apparel manufacturing industry, the growth in employment for fashion designers would be about the same as the average for all occupations nationwide. Growth in employment for fashion designers who design clothing and accessories for retailers and the mass market will continue to be strong over the next decade. New innovation in fabrics, design technologies and styles will also spur demand for fashion designers over the next ten years. The best job opportunities in fashion design will be obtained by designers with degrees from reputable schools, who have experience and have developed compelling portfolios that show case their work. However, due to the large number of people seeking employment as fashion designers, competition for positions will be strong. Most job opportunities for fashion designers will be found in major metropolitan areas in New York and California. As of 2014, there were approximately 22,500 fashion designers employed in the United States. Fashion designers work in wholesale, retail and manufacturing sectors of the fashion design and clothing industries. They work for design firms, retailer, apparel companies, theater and dance companies, as consultants or independently. The largest number of fashion designers work in wholesaling and manufacturing. The clothing lines and products developed by designers working for by wholesalers and manufacturers are in turn sold to major retailers, specialty apparel stores, online retailers and catalog companies. While many designers dream of working independently and developing their own clothing line, most fashion designers work as "in-house designers" for large corporations. A few fortunate (and talented) designers will design their own clothing lines and develop their own unique personal brand. As of 2014, the industries that employed the largest number of fashion designers include the following. Apparel and merchant wholsalers 28% Apparel manufacturing 17 Management of companies and enterprises 12% Specialized design services 5% Electronic markets and brokers 2% Fashion designers usually work normal hours in comfortable offices, but are sometimes required to work long hours to meet deadlines. Freelance designers must be flexible to meet their clients' needs. They also work long hours and must work hard to find new clients and satisfy their current customers. Designers travel extensively to attend trade shows and meet with fabric suppliers in various regions throughout the world. They must constantly communicate with suppliers, manufacturers, and clients worldwide. The majority of fashion designers work in the states of New York and California. The following are few additional resources and associations we recommend for aspiring fashion designers and fashion design students. Copyright 2018 CareerProfiles.info, All rights reserved.